Where do I use my Farah voucher code? If you’re a fashion conscious male who loves the latest trends then Farah is the ideal retailer for you. With a plethora of menswear including shirts, outerwear, knitwear, trousers, t-shirts, polo shirts, sweats and shorts as well as jeans, fashion essentials, suits, smart and casual footwear and a range of accessories, you can stock up your whole wardrobe with quality pieces that are extremely affordable. Browse through the various categories at Farah including the ‘collections’ and ‘new arrivals’ ranges to find on-trend clothing that’s fresh off the catwalk. If you’re shopping on a budget there’s also the sale section too, where you’ll find plenty of discounted items with plenty of sizes still left in stock. Create your ideal outfit with shoes, a jacket and even a bag included and enjoy free delivery and up to 10% off when you order online. With a handy size guide and plenty of payment options available, Farah makes it easy for you to by online, sending your order straight to your door in a matter of days. With new collections every season and regularly updated categories and discounted items, you’ll always find something affordable and new for your wardrobe at Farah. Farah has a ‘collections’ section on their website where they feature a range of similar products that all share the same specifics and style. Currently, Farah has two collections available: the Jeans collection and the Classic collection. The Farah Jeans collection combines timeless menswear essentials with urban designs. A well-edited selection of beautifully executed pieces that are ideal for the modern day man. If you’re after more formal pieces you can check out the Farah Classic collection, a flawless blend of British heritage and elegant design. Perfect for any age, the Classic collection is the ultimate destination for the modern gentleman. Get up to 50% off wardrobe essentials to refresh your day-to-day and evening looks in the sale at Farah. In the sale, you have the chance to stock up on everything including shirts, jackets, trousers, shorts, vests, shoes, waistcoats, jumpers and much more. All these sale items are extremely affordable with loads of sizes available, however, they won’t last long so make sure you snap them up before they’re updated with newer discounted pieces. The Essentials selection features handpicked wardrobe staples, in a mixture of classic and seasonal colours. Lambswool, Merino wool and soft cotton fabrics are just some of the materials used for Farah’s everyday pieces that will fit the part in every wardrobe. Farah Essentials are perfect for any modern man who loves to stay stylish with affordable fashion. In this section you’ll find pants, jackets, t-shirts, polos and shirts in both neutral and more stand out colours, so whatever you’re looking for you are sure to find it in the essentials section. If you’re not 100% satisfied, you have 28 days from the day you receive your order to return it back to Farah. Farah is a top online retailer of men’s fashion, footwear and accessories. With everything from shirts, knitwear and sweats to bags, suits and jeans, Farah is the perfect place to come for affordable, top quality menswear. 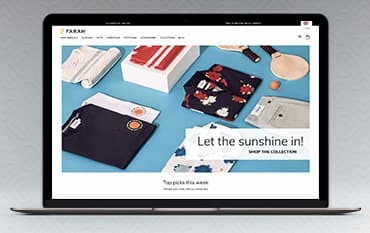 Shop online with a Farah discount code from us and save money on your order, and with free delivery and plenty of sale items also available on their site, there are more ways than one to grab a bargain. Whether you’re looking for smart evening attire or casual everyday wear, you can find all the menswear you could need at Farah.